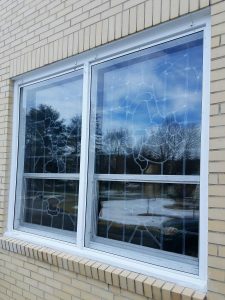 Still a strong supporter of combination storm windows and doors, we offer products with a variety of features to provide protection against New England weather conditions. These aluminum storm windows and doors can make a significant improvement with regard to air infiltration and insect defense. 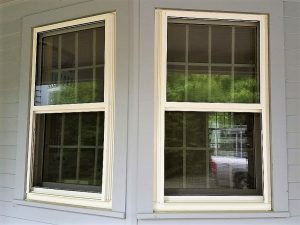 Triple track, self-storing windows are still an economical alternative to replacement windows if your existing prime windows are in good condition. 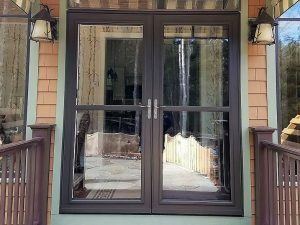 Aluminum combination storm doors come in a variety of styles and colors. Many of the doors we offer can be ordered in custom sizes. Aluminum storm doors provide excellent protection from the elements and allow you to welcome in the sun without inviting in the neighbors pets. Full Lite style storm door pair setup with self storing glass & screen panels. In addition to the manufactured windows, we also fabricate fixed (non-operating) deadlites (storm panels) in several frame types, sizes, and finishes. These panels that we produce can be glazed with a variety of products such as: annealed window glass, acrylic and poly carbonate as well as tempered safety glass. Let us help you determine what product best serves your application. Extruded aluminum “Deadlites” (stationary storm panels), custom fabricated in house by our team.